I have been dreaming about Colorado a lot lately. At random moments, a John Denver song will pop into my head and I’m thinking about the Rockies and the way Colorado felt. I lived there for two years in my early teens, and while at the time I probably didn’t appreciate it as much as I should have, now I find myself missing it horribly. Recently I have started a story that takes place in Vail though I have never been there. In face, I have never been to Denver, Boulder, Red Rocks… I lived in the middle of the state, half an hour from Leadville (been there), an hour from Aspen (haven’t been there), and a few hours from Ryal Gorge and Canyon City (been there!). I wish I could have seen Aspen, but Mr. B didn’t want to see how it had changed from the 70s when he had seen it. I can understand that. But oh, Colorado aspens, can I rave? I’m not sure why Colorado is calling to me, except for lately not really feeling like I”m in the mountains. Strange since yesterday was one of those perfect stormy, mountain days. A day where the mountains were obliterated by clouds and we woke to snow all the way down. But since I live on the valley floor, I feel like I’m more in the country. Strange as well since I have to only walk fifteen to twenty minutes and I can be climbing up the mountains. I’m that close. But California mountains are different from Colorado mountains. I remember telling a boyfriend, who visited from Pennsylvania, that we did everything big out here, but our mountains are nothing compared to the amazing beauty of the Rockies. The sheer size of 14,000-foot peaks can’t be explained. Mt. Princeton, outside of Buena Vista, CO, one of the collegiate peaks. Harvard, Yale, and Columbia, the rest of the 14K collegiate peaks. There is a wildness about Colorado. Still untamed. Still undiscovered, though I doubt that is the case. I just remember visiting Tincup and that had once been something, but was no more. Okay, there was sort of a town, but one place we stopped outside of Tincup was what you see in the pictures above. The way the wild had claimed everything again. The way the exploding brightness of the sun shone on the clear mountain streams, being so high up the air was crisp and clear. The air was so pure. So clean. So cold and brisk. The mountains, lakes, and aspens were magic. I love California with all of my heart. This is my state. This is where I come from. I’m a fifth generation and the Sierra Nevada mountains are my ‘home’. But there is something about colorado that just makes me want to come stay a bit and visit again. With my camera where I can take so many pictures I couldn’t possibly forget. To visit St. Elmo where the hummingbirds take over the historical ghost town….. while across the street the chipmunks enthrall people…. that is one place I definitely want to see again. I started on Saturday feeling this way. And I’ve continued through the day. I hate Daylight Savings. I’m probably one of the millions of people that say that, but can I underscore it? There isn’t enough coffee in the world to take care of the hour change hangover. I slept in till 11 this morning and just now I thought, oh it’s still 5-ish, when it’s a quarter past 7. Sigh. Not to mention I have spent the last two days feeling guilty that because of the massive rain and storms that blew in on Saturday morning, I wasn’t able to make it to the writing group, and because I had the key, we had to cancel…… though at 10 am when it would have started, the rain had abated. Sort of. Sigh. I always feel really guilty when I can’t follow through on something I said I would do or make or arrive at. I really felt so guilty all day yesterday it was tearing me up. Not literally, but I was tweaked. Then the rain. Oh, the rain is good. We so need it in CA, but it’s cold. And dreary. And depressing. And wet. So wet. So wet in fact that the water filter seems like it won’t even put water through because the humidity is so high. Blah rain. And I had hope to spend some of Saturday writing. Nada. Okay, well I was writing in the middle of the night as the time change happened, but technically it was Sunday. I sort of lost my mojo for the weekend. It probably has to do with the slew of doctor’s appointments this week and paperwork I have to fill out for a new doctor I’m seeing soon. Bleh, I hate filling out forms. So, I’m blaming Spring Forward as my blah moment. I feel really blah right now. Now go enjoy the rest of your short evening since it took you all day to get here. And ignore my blah, useless moment of complaining. Today’s Prompt: Where did you live when you were 12 years old?Which town, city, and country? Was it a house or an apartment? A boarding school or foster home? An airstream or an RV? Who lived there with you? I am going to use this as an opportunity to write some of my character, Phaedra Quinn’s back story. Enjoy. 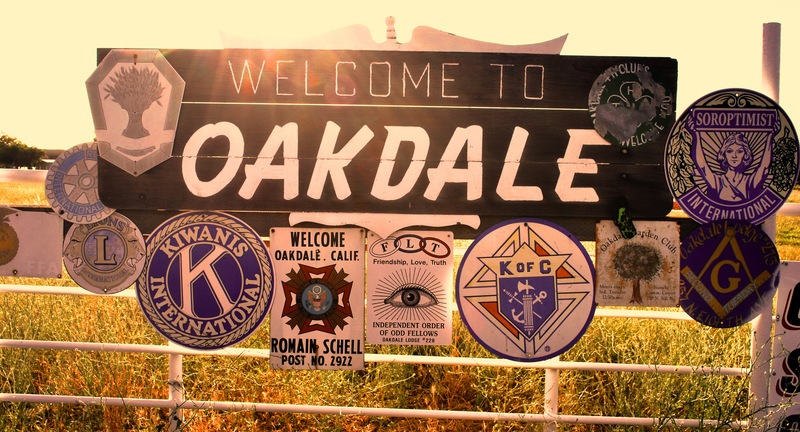 I have spent almost all of my life in the small town of Oakdale, California. It is considered “The Cowboy Capital of the World”; that is it’s motto anyhow. I’m half Irish and half Croatian, and country has never been my thing, but my Da has always loved the country. So we moved here when I was 5 and that is still where Momma and Da reside. It’s this cool, older ranch style home. Columns frame the front door and there is brick everywhere. I hated the brick when I was younger, but now it’s so pretty and antique-y. It fits my parents to a T and I can’t see them anywhere else. The front isn’t very exciting with the lawn, brick path, and basic shrubs that everyone plants for landscaping. My da doesn’t have much of a growing thing in him, so he keeps it simple and low key. A few juniper shrubs and Momma plants daffodils wherever she can. But the backyard is nice. Da put a patio out there with brick and he likes to grill in the summer. Because Da likes to work with wood, he built me a swing set when we moved in. I used it for years, swinging long hours by myself with my Barbies, or when I would have Coco over. Then, when my sister was born when I was ten, the swing set became hers. It’s still there and on summer afternoons when I drop in for the weekend, Olivia and I can still be found giggling over boys and college and life as we sit opposite each other and sway. Da built Momma planter boxes and a few benches to put around the yard and a whole dining set. Like I said, he likes to build. The yard is our haven away from life. And like a typical ranch style home, you step into the house and are right into the living room. The kitchen is at the back and the dining room off to the side of both the kitchen and the living room. Go down the hallway and there are three bedrooms. First mind, then Olivia’s, and finally my parents room. There is one bathroom, oh, and an office right across from my bedroom. When I was younger, my room was in shades of pink and totally girly. As I got older and hit my teenage years, I slowly started removing bits and pieces of pink, replacing it with more blues and greens. But in in the time of 14-18, I had this fascination with anything rose scented. I used rose perfume, oils, creams and potpourri. I think the rose scent permeated the walls and everything because now, even though all of my stuff is gone from the room and it’s just a guest room, there is still a hint of rose that escapes into the air like a fine mist. The room is still my room even though I only sleep in it about once a month. Thankfully Momma loves rose otherwise we’d have trouble. Downtown Oakdale, California via (Joellen Chappell Real Estate )The house is homey and warm. the living room has this ‘hideous’ bright orange velvet velour sofa that is a relic of my great-grandparents. Momma hates it. She tries to dress it up with bold throw pillows, but it’s kind of hard to disguise a bright orange velvet couch! And as for Oakdale, well when I was growing up it was a lot smaller than it is now, but even so, it’s still a rather cool place. I used to go with my girl friends to the Hershey’s plant on weekends, but it was bought out in ’08 by another company. It’s rather sad since I remember it all of my growing up years. The town is famous for it’s rodeos and country life, but I never took much interest in that except for dating Kevin Hart who was a country boy at heart. No pun intended. Kevin and his brother Jesse run Broken Harts, the bar their daddy started years ago. But that’s about as country as I get,; going to the bar. 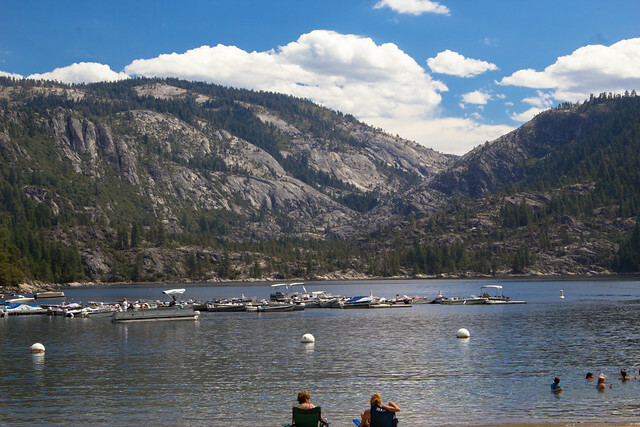 I always loved that Oakdale was near the mountains and in the summer, Da would drive us all up to Pinecrest Lake for the day. Only an hour and a half away, it was the best way to leave the heat of the Central Valley and foothills of CA and get up into the cool mountain air. It still has some of my best memories. So, there is my home that is still my home, when I was 12. I love that it hasn’t changed over the years and I can always go home if I want to. So, there is my character, Phaedra’s, take on her home at 12, written in her style, or hopefully her style and not so much as mine. “I feel like a I’m in a panini press,” she said as she slumped into the ironwork chair at the local brewery. “How so?” her friend asked and twirled his finger to catch the waitresses attention. He laughed. “What you need is a beer. Sandra, we’ll take a round of the IPA and bring out some of the double fudge ice cream,” he ordered. “You think that’ll help?” she asked as the waitress walked away. So, it’s one of those California bake everything in sight days. 102F on the thermometer. YUCK is all I can say. I was writing a bit of poetry and the idea of being in a panini press made me laugh. Except for the fact that my shoulders are burnt. Bleh. I’m in a cloud bank. A wet and rainy mist-shrouded world of constant drip, drip, dripping. Plunking on the metal roof, and a perpetual splat sound echoing outside. Rain, rain, rain. It’s wet, it’s misty, it’s damp. Paper is feeling damp. The hygrometer says it’s 77% humidity in the house. Damp, damp. Soon anything that shouldn’t mold, might start. It’s an old house. Things mold. Musty smells are common. Thank goodness it’s not Britain…. The year started off dry. So dry. With one small snow storm that turned to ice for weeks… or a week (a week of ice feels much longer than it really is). No rain. Dry, dry, dry. Everyone kept asking. “Well, what are you going to do if it doesn’t rain?” This was in December or early January…. Can I smack those people now? Not rain! Ha! Right. Why do people feel the need to bemoan the weather before the season is even over? I get so tired of people saying it’s too wet, it’s too dry, it’s too windy, it’s too hot, it’s too cold. Really? Is there any perfect weather? Uh, no. We live in California. It can rain, it can snow, and it can be dry. Heck, it can do that all in one afternoon where I live. You think I’m joking? The standard reply to whether or not you like the weather is to wait five minutes. It can change that fast here. Yet people that live here feel the need to predict the bad weather 6 months in advance, or ask me what I might do because of the bad weather, when the result will be six months from now. That’s like asking me right now what I plan to have for dinner on the 8th of August. Tell you what, why don’t you call me up on that day and ask me. Not now. So, rain rain rain. It’s good. There might be some minor flooding for the area, but hey, we can handle it. Though I’m sure someone, somewhere is going to be complaining there head off about it. Don’t look at me, I don’t make the weather. Ask the Big Guy upstairs. I live in the mountains. Not technically in the actual mountain mountains, but in a valley surrounded by mountains. At an elevation of 3000 ft. and being that I am in Northern California we are in what the Sunset gardening book calls a zone 1. That means at any time of the year we can get snow or a freeze. Yup, ever heard of snow in July? Well it has actually happened here. Not to me personally, but it has happened. Usually though, the weather is pretty typical. The past few days have been in that category after a week of nights down in the twenties. We’ve had sun, a little too much, and warm temps, a bit more than I want. But it’s finally Spring. I mowed the lawns the other night, which is a challenge and a half using the electric mower (my parents say the gas is way worse, quit complaining) and dealing with all the excess weeds and various rock piles I may or may not run over. But oh, when the lawn is mowed it looks so lovely. Perfect. Even the tall weed patches have some defined shape. Throw in a sweet resinous smell that comes down from the mountains after the pines have baked all day in the sun, and then good clean spring smell and you have somewhat the epitome of the mountains. Okay, it is actually better when you smell wood smoke but that was nixed the other due to it being warm. However there were the distant sounds of a dance going on at the small rodeo grounds. Today is our annual local rodeo. A joke in itself. I’ve been once and I’m not impressed, but I love the sounds that come up from the rodeo grounds. And it turns out after going up into town today and seeing the signs posted that it wasn’t a dance but actual rodeo proceedings. Personally I would rather picture a rodeo dance on the grounds. More fun, inspirational, romantic that way. The mountains are cool, unique and very much me. I told my cousin recently that was a city girl, and it’s very true. I am very girly girly, though I have to stick with jeans and boots most of the time due to living in the country/mountains. However, I while I would love to wear heels and skirts more, have sidewalks and stores that actually carry what I want, I love being in the mountains. I love that a storm can come up out of nowhere, which it did today. I love being able to step out at night and see all the constellations and stars. Oh the stars you can see in the mountains. So clear, so bright. I love the smell of pine, sweet grass, and cow manure. I love seeing all the birds and having deer walking down the street, a la Northern Exposure style. The mountains are kind of my home place. I don’t have an actual home place after moving around all my life, but I could say I feel most at home in the mountains. I’m afraid I’m not a very good blogger. Most of you who subscribed this year were probably hoping I’d blog more. I seem to be quite terrible at writing anything terribly exciting, at any normal time. Just about every other blogger I follow myself, seems to post around the same time each day. With me, you are lucky if you ever know when I am going to post within a given week. Granted, you all know that you will get something once a week due to my commitment to Post Once A Week. But other than that, you might get something interesting, a real post, or it might be me spitting out some poetry. Hopefully it hasn’t been too annoying. I know that I’ve followed some that I’ve never seen a new post since. Sometimes it bothers me, and other times I’m kind of thankful due to how many blogs I read on a given day. Now, I don’t want any reassurances. I’m just letting you all know that I appreciate the fact that you’ve decided to follow me, even though I don’t regularly post. That being said, I’ve been spending the week working on writing and staying cool. The part of California I’m in has been a bit hot. I had plans to post on the D.C. earthquake, but I figure after Irene, I shouldn’t do any harassing of those East Coasters. You’ve all had a bit of a run this past week. I did think aspects of the quake, and because I’m a born and raised CA girl, were somewhat funny, but again, I won’t be mean. Hopefully the mess from Irene will be cleaned up quickly and let’s hope no more big storms hit the east coast. Every year is buggy. Every year there is some bug that takes over and there is an over abundance of them. This is the year of earwigs. Can I get an ‘ugh’, squeal, or groan? Any shudder you want to add is fully appreciated. Yes, this year there are earwigs every where. Literally. EVERY WHERE! I am finding them in the shower, in my bath pouf when I go to soap up, in the utensil drawer in the microplane, oh, and there was one in my bed the other day. It is gross. Now, I did some research on them. Wikipedia, I love you. 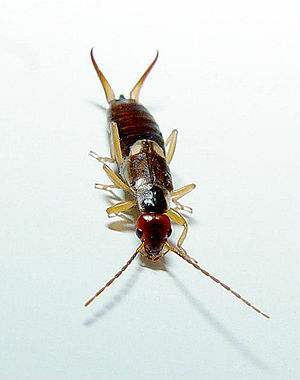 Apparently earwigs are not harbors of disease, and they are not a ‘gross’ insect, but honestly, there is something too disgusting about them to not be creeped out. I can’t help it. It all started when I was a little girl and my cousin introduced them as pincherbugs. I was terribly afraid of them then. I can’t say that I’m afraid now, but I can’t say that I’m not afraid of them either. I have never been ‘pinched’ by them, but they do bite. Usually along my midriff when I’m in the shrubs. And in the end, some times earwigs can be good in the orchards. It’s just in the garden that they are pests. They don’t discriminate on what they eat. They just decimate some things. And they come out in droves. It’s horrible. 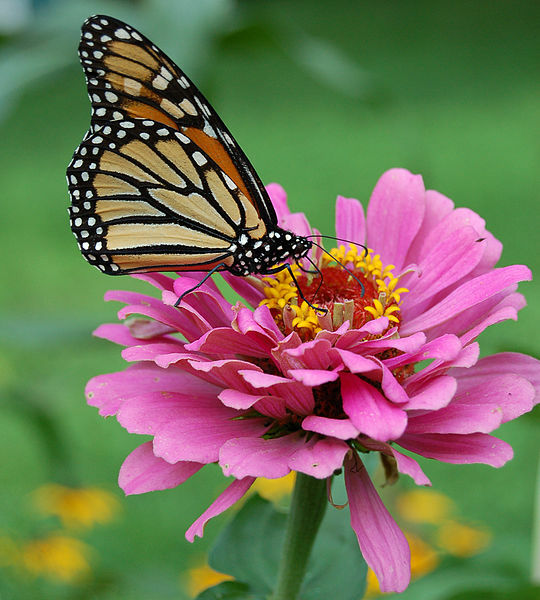 Why can’t you have the year of the monarch butterflies? Or the year of the praying mantises? That would be FUN. No, it’s always the bad bugs. 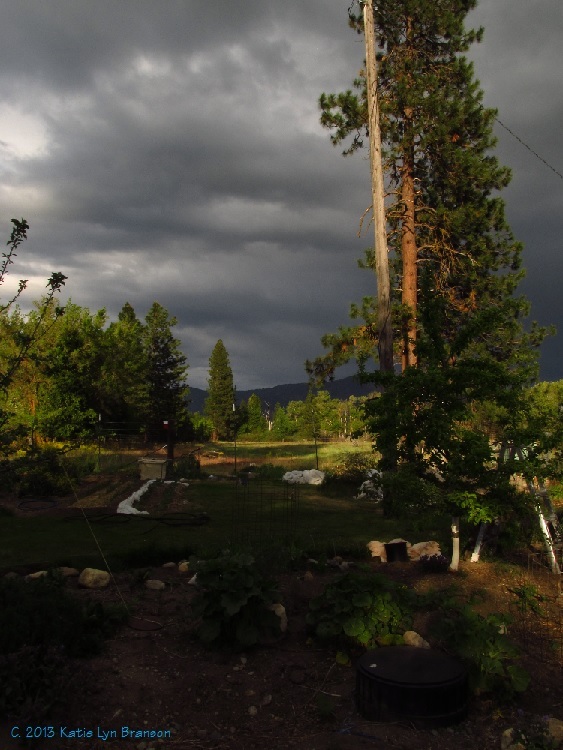 Slugs, knats, mosquitoes, hornets, cutworms, miller moths…. Yucky bugs. Well, this is the year of earwigs. I’ll let you know when I stop being grossed out.